Step 1. Preheat oven to 180°C. Line 4 oven trays with baking paper. Step 2. Use an electric mixer to beat the butter and sugar in a medium bowl until pale and creamy. Add the egg and beat until well combined. Step 3. Add the banana, sour cream, flour, bicarbonate of soda and baking powder, in alternate batches, and stir until just combined. Step 4. Spoon level tablespoons of mixture onto the lined tray, 5cm apart. Bake 2 trays, swapping halfway through cooking, for 10 minutes or until puffed and golden. Set aside for 5 minutes to cool slightly before transferring to a wire rack to cool completely. Repeat with remaining trays. Step 5. Meanwhile, to make the cinnamon cream cheese, use an electric mixer to beat the cream cheese and butter in a medium bowl until pale and creamy. Add the icing sugar and cinnamon and beat until well combined. Step 6. Place whoopies, base-side up, on a clean work surface. Spread a little of the cream cheese mixture over the base of half the cakes. Sandwich with remaining cakes and place on oven trays. Step 7. 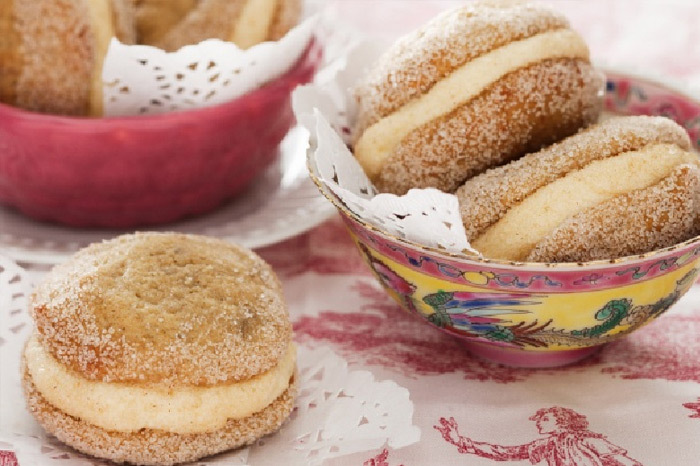 To make the cinnamon sugar, combine the sugar and cinnamon on a small plate. Roll the edge of 1 cake in the cinnamon sugar to lightly coat. Place on a serving tray. Repeat with remaining cakes and cinnamon sugar.